This months guest blog is provided by James Doherty. It takes a look at the incidence of smuggling in the harbour from a historical perspective. Its a very exciting topic, and one that has not received much attention in the past. I sincerely hope people enjoy reading it as much as I have. One of the first instances of formal taxation dates to the reign of King John I, when in 1203 he ordered a tax placed on woollen goods leaving his jurisdiction for the continent. Inevitably as soon as rulers sought to levy taxes men sought ways to avoid such taxes. 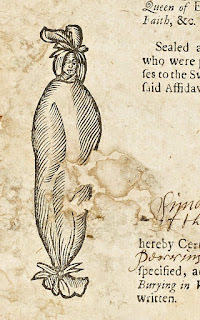 The history of smuggling is intricately linked with the history of taxation. Smuggling in its simplest form is the movement of goods from one jurisdiction to another with the express purpose of avoiding taxation or levies. The non-payment of duties owed makes the smugglers goods considerably cheaper than his legitimate competitors whilst still offering substantial financial return. By its nature smuggling is a difficult subject to research; the most successful smugglers are the ones that no one has ever heard of. The level of detection is low and primary sources are scarce. The majority of historical evidence comes from the perspective of the people trying to catch the smugglers. 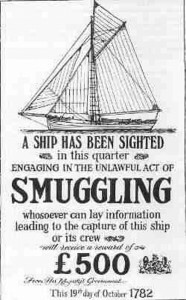 This article hopes to provide a brief explanation of the factors that influenced the growth and decline of smuggling, the type of goods smuggled and provide some local examples of this clandestine trade. Generally when people think of historic smuggling the image that comes to mind is teams of men unloading casks of brandy or gin, however a wide range of products were smuggled. In addition to premium items such as spirits a wide range of other items were moved such as tea, wool, salt, playing cards, banned publications (such as bibles during the penal times) and people leaving Ireland as fugitives. Being relatively light and highly taxed spirits, tea and tobacco were a popular choice for smugglers. However the earliest large scale smuggling in Ireland revolved around more mundane items like wool and salt. 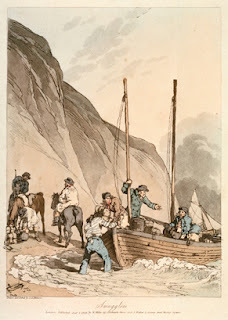 Wool and salt provide two good examples of the two main external factors that influenced Irish smuggling namely taxation and trade restrictions. To pay for his military campaigns King William III introduced a tax on domestic salt production in England in 1693[i]. However this tax did not apply in Ireland which had the unintended consequence of leading to an explosion of smuggling from Ireland into England. This smuggling was carried out on such a scale as to decimate the traditional salt industry on the coast of England[ii]. Throughout a large portion of its history England followed the economic theory of mercantilism. The basic tenant of this theory is that imports into the empire had a negative effect whilst exports were positive. During the 17th and 18th century parliament in Westminster passed several acts that were designed to restrict Irish and benefit English trade. In 1663 the Cattle Acts prohibited the export of cattle to England this encouraged Irish farmers to switch to wool production. When the Irish wool trade flourished it threatened manufacture in England. As a consequence of this perceived threat to industry the taxes on wool imports into England (which already were subject to duty) were greatly increased with the Woollen Acts of 1699. 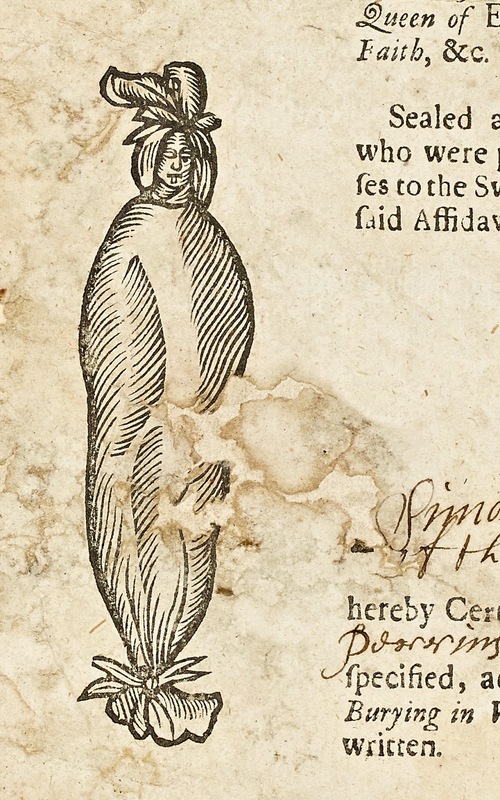 A novel feature of this act stated that it was illegal to be buried in a shroud made of Irish wool (unless you were a victim of plague). Effectively excluded from the English market these trade restrictions greatly increased the scale of wool smuggling from Ireland into France where the price of wool remained high and the markets open[iii]. One of the earliest recorded local mentions of the clandestine trade dates from October 1594 when Sir William Russel Lord Deputy of Ireland “granted a commission to search in Wexford, Rosse, and Waterford for prohibited wares to pass for France[iv]”. The Lord Deputy didn’t state what wares his men were looking for but wool would have been likely. 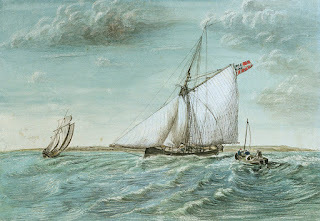 The high-water mark of smuggling was from the period of 1750- 1850. This period saw high taxation as England fought a series of wars with France. It was also a time of high consumer demand for luxury products which were smuggled into the Ireland such as tea, spirits and tobacco. The beginning of the 19th century would also see increased preventative measures with revenue cruisers patrolling Irish waters and the formation of the Coastguard. Waterford would play a key role in the war on smuggling, when seven permanent cruiser stations were established in Ireland one of the locations chosen was Dunmore East[v]. The successes and failures of the Dunmore based cruisers such as The Hound or The Pygmy was covered extensively by the local papers[vi]. The often substantial seizures by these cutters gives an idea of the scale of smuggling being carried out along the Irish Coast during this time period. The smuggling sloop Isis provides a good example of the activity Sir James Dombrain lamented in his report. In September of the same year that the Coastguard was established the revenue cutter Richmond seized the sloop Isis after a 6 hour chase which had started near the Saltee Islands. A modest 18 kegs of gin were discovered on-board after the sloop was inspected at Waterford Quay. Its prime cargo however was tobacco, the Isis contained 300 bales of tobacco weighing over 13000 kilos. Although the Isis had sailed from Holland it was revealed that a local man from Tramore was part of the crew. When earlier in the same week a similar vessel was seized its cargo was valued at between 6 and 7 thousand pounds[viii] (worth nearly a million euro in modern terms). Ships like the Nelson and the Isis primary cargo was contraband tobacco with their crews taking a calculated risk with the hope of earning a tidy profit. Opportunistic smuggling was also widespread throughout the first half of the 19th century. Sailors returning from countries where tobacco was cheap often brought smaller amounts of tobacco with them with the view to supplementing their wages. In 1825 the Morning Register newspaper reported that two ships recently returned from Quebec were being held on the quay in Waterford as tobacco had been found on board. In this case the paper reported that one young “lad” had been convicted of smuggling[xi]. It is unlikely that a young man perhaps on his first voyage would take it upon himself to engage in smuggling so the reasons why he was convicted over his shipmates can only be guessed at. A darker side to smuggling existed and as preventative measures increased the smugglers often resorted to brute force or the threat of violence. The reports of smuggling seizures and chases mentioned if the smuggler was armed or not and the level of force used by the revenue cutters to seize vessels. An early violent encounter occurred in December 1792 when the Waterford Herald reported on two incidents of smuggling the first was a seizure of 320 kilos of tobacco at Bunmahon and the second was an armed confrontation between an unnamed ship and two revenue cruisers. It was reported that one of the cruisers sent a boat to board the smuggler which was fired upon by the smuggling crew. Despite the best efforts of the two revenue ships in this case the smuggler escaped[xii]. Although preventative measures would force smugglers to change their tactics it was a change in economic policy that would lead to the eventual decline of smuggling. From the 1840’s on the British would start to move towards a policy of free trade which saw the removal of import duties and the lessening of taxes. This policy made smuggling less profitable and the practice gradually died out. It is very difficult to measure the size of smuggling activity along the Irish coast with some estimates saying that half of all tobacco consumed in Ireland was contraband during parts of the 18th and 19th century. It is evident however that large scale smuggling occurred along the Irish coast and was organised on an impressive scale. This is the third or our guest blogs. The intention is to offer a platform to others who are writing about the maritime heritage of Waterford harbour an opportunity to publish their stories. If you would like to contribute a piece, please email me at russianside@gmail.com. The only criteria is that it needs to have a maritime connection to the harbour and a maximum word count of 1200 words. I will format, source the photos if required and add in the hyperlinks. Guest blogs will be published on the last Friday of each month. Our next guest blog is scheduled for Friday 31st March and comes from Brendan Grogan. Its a piece about his Grandfather, Captain Farrell who went to sea at age 16 in 1878 and went on to become a master mariner and harbour master of Waterford. I can't wait to share the story with you. [iv]Journal of Sir William Russell, Lord Deputy. From 24 June 1594 to 27 May 1597. Very interesting. Any chance that you would come up stream and do an article on the boats that plied between Carrick and Clonmel.